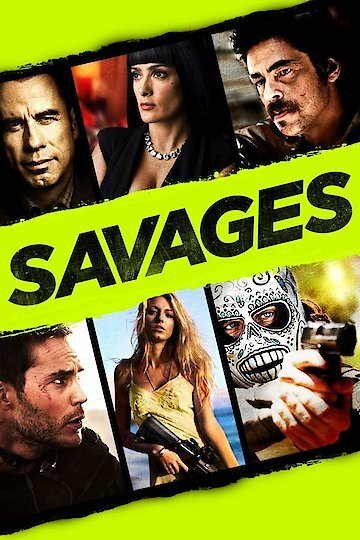 Savages is a crime thriller directed by Oliver Stone. Based upon the novel by Don Winslow, he and Stone wrote the screenplay with Shane Salerno. The film’s ensemble cast includes Taylor Kitsch, John Travolta, Salma Hayek, Aaron Taylor-Johnson, Benicio de Toro and Blake Lively. The story follows best friends Chon (played by Taylor Kitsch) and Ben (played by Aaron Johnson) as marijuana growers in Laguna Beach, California. Former Navy SEAl Chon smuggled the plant seeds out of Afghanistan. Because the seeds were able to yield a very strong type of marijuana, they attracted a large customer base that made them extremely wealthy. The two men share a girlfriend called O (played by Blake Lively). As Ben does overseas charity work, Chon receives a video from an unknown man. Lado is a cartel enforcer (played by Benicio del Toro). The disturbing video depicts severed heads along with a chainsaw, which causes them to be concerned about Ben, believed to be a victim. Ben returns the next day, so he and Chon arrange to meet with the cartel in Mexico. Thus begins a hasty retreat after refusing the cartel's partnership. The plan is to hideout for a year with O in Indonesia (who is unaware of what happened with the cartel). Dennis, a corrupt DEA agent (played by John Travolta) advises them to partner with the cartel. O is then kidnapped by the cartel with Lado. Cartel leader, Elena (played by Salma Hayek) informs the guys that they intend to harm O unless they agree to form a partnership with the cartel. Chon and Ben seek the help of Dennis, but the men fight. Chon enlists his Navy SEAL friends to attack the cartel truck, killing seven. They decide to blame Alex (played by Demian Bichir) for the killings. Dennis helps them falsify evidence so that Lado tortures Alex until Ben is forced to kill him. The man begs for his life during the torture, revealing that Elena's daughter Magda is actually still alive. O is kept in horrendous living conditions but she is allowed to contact her mother. O is also drugged and Lado records himself attacking her. Dennis is bribed with $3 million by Ben and Chon for information on Magda. They kidnap her and contact Elena through Skype to establish their control. After they arrange a meeting to release O and Magda, a shootout ensues. Chon, Ben and O then depart to another unspecified country. Savages is currently available to watch and stream, buy on demand at Amazon, Vudu, Google Play, FandangoNow, iTunes, YouTube VOD online.